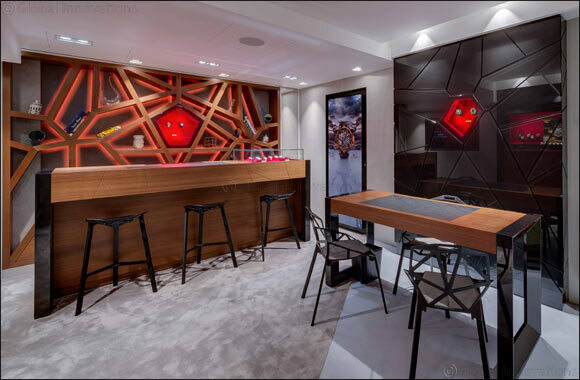 Dubai, UAE, October 20, 2018: In summer 2018, a new Roger Dubuis store has opened in the world-famous principality of Monaco. Over the past year, the watchmaker has been accompanied by the roar of Lamborghini engines, so it is only fitting that it should take up residence on Le Rocher – the “Rock” – an iconic luxury destination and the birthplace of the car industry. Within this 27 sqm space, Roger Dubuis emphasizes duality with an asymmetric beige silk rug on a polished concrete floor, walls in raw materials decorated with finely-wrought mirrors and marquetry, as well as an imposing bookcase in satin-finished American walnut opposite a window that allows light to flood in... Raw materials meet pure refinement.